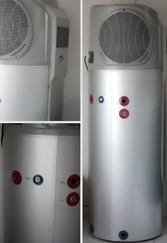 THE FUTURE OF THE HOME AND BUSINESS HOT WATER HEATING IS WITH HEAT PUMP TECHNOLOGY. The ACS Eco Hot Water Heat Pump has been specifically designed to provide a low energy hot water supply. Using a dedicated Domestic Hot Water Heat Pump system will realise significant savings to the homeowner, in fact up to 30% can be shaved from your monthly account. Your ACS Eco Hot Water Heat Pump has a compact design with a 270 litre vetro enamel lined water storage tank and the heat pump all as one integrated unit.